Do we need to watch what we spray? A summary of our recent review on the potential dangers of phage biopesticides. Guest post by Sean Meaden, PhD student at University of Exeter working on phage-Pseudomonas syringae-plant host interactions. It seems barely a week goes by without mention of the dangers of antibiotic resistance in popular news stories. Just last month the WHO called antibiotic resistance a ‘global threat’ in a well-publicized press release . Whilst this might be slightly good news for those of us soon to be looking for post-doc positions in the field of microbiology, it certainly isn’t good for public health. The need for alternatives is pressing and it seems there just isn’t the financial incentive for large pharma companies to develop new drugs. Better stewardship of the compounds we already use is crucial, but so is exploring alternative options and exploiting our knowledge of microbial ecology and evolution. One alternative strategy, known as ‘phage therapy,’ is the utilization of viruses that infect bacteria to decrease density of specific bacterial populations. In nature, phages have been estimated to kill as much as 20% of global bacterial populations each day . As many reviews have noted, the use of phages is nothing new and has been a successful ongoing industry in Georgia and the former Soviet Union since the 1920s . 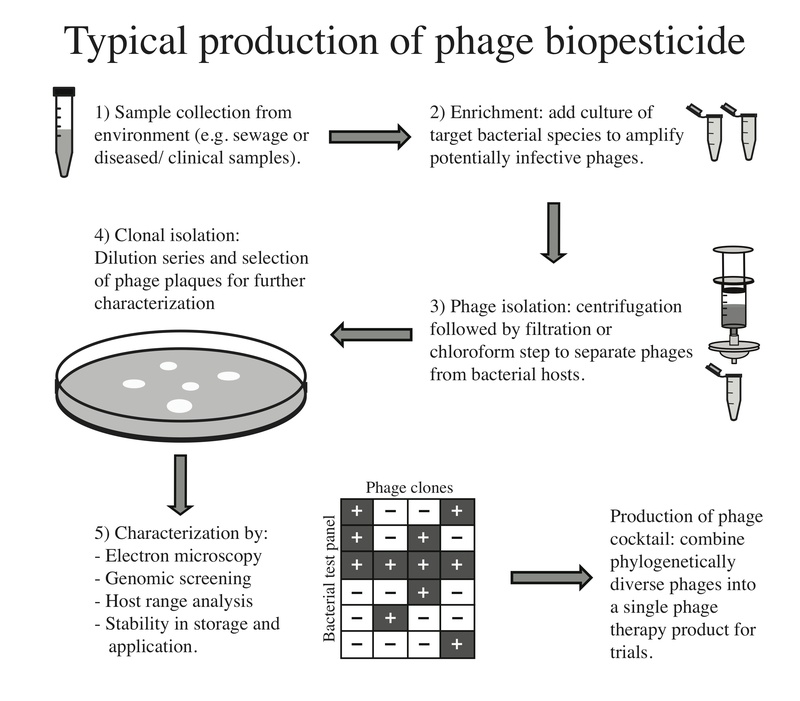 The aim of phage therapy is to find or create a phage that specifically infects a pathogenic strain of bacteria, culture it in the lab and turn it into a useable end product that can be ingested, applied topically or sprayed onto crops (as a biopesticide). The potential benefits of phage therapy are huge. However, given the negative consequences of improperly managed antibiotic use, we should be careful not to make the same mistakes again. It strikes me that a common theme in the phage therapy literature is ‘It’s OK, phages are naturally occurring,’ implying (in my mind at least) ‘What can go wrong?’ The same argument could have been made about antibiotics. After all, they too are naturally occurring compounds produced for microbial battles among themselves, and are likely to have been around for billions of years . In our recent review  we explored the possible negative consequences of phage therapy to assess whether we are likely to make the same mistakes as we did with our often poor stewardship of antibiotics. Below is my summary of the main arguments we outline in the paper. On the whole I think the need for alternatives to antibiotics is huge, and by being prudent with our use of phages as a replacement (or synergistic treatment), and critically evaluating negative consequences, we will be better placed to use phage therapy successfully. 1) Implications of evolved resistance. This fairly obvious point is probably most comparable to antibiotic usage. We know that phages and bacteria undergo arms races of resistance and counter-resistance . If the pathogens that are causing disease evolve resistance to the phages that we use as therapeutic agents, our cure becomes defunct and we have to go back to the drawing board. Finding new infective phages shouldn’t be too hard, but the process of turning them into a usable product that has passed regulatory hurdles is likely to be lengthy. This is a parallel problem to antibiotic production- there must be novel antibiotic compounds in the soil under our feet, but turning them into a lifesaving drug is the tricky part. A solution proposed by a group working on burn patients in Belgium is to create a reactive, cottage-industry style phage therapy centre that quickly screens for phage infectivity from a ready-made library, rather than a single product for widespread consumption (and most desirable to big pharma) . Whilst this approach is great for pathogens that are readily culturable in the lab it might be more difficult for less tractable organisms. 2) Phage mediated attenuation of bacterial resistance. This argument seems to pop out of the literature as ‘OK, the bacteria might evolve resistance, but that won’t matter because resistance is costly so their virulence will be attenuated’. In a few cases this certainly does seem to be the case, for example Filippov et al. found reduced virulence of Yersinia pestis in mice (in other words mouse plague was less deadly when phage resistance had evolved; 8). In other cases, phage resistance actually had the opposite effect, making Pseudomonas aeruginosa more virulent in vitro, and rightly highlighting the need for caution in selecting phages for treatment . Thus, for this argument to be used informatively we need much more data from a variety of systems and under more natural conditions or full-scale trials. 3) Agricultural cross-over. A consistent criticism of global policy on antibiotic stewardship is the use of antibiotics in agriculture. The addition of antibiotics at sub-therapeutic levels is great for feed efficiency and increasing yields. Given the increasing demand for protein in the global diet this issue isn’t trivial. However, it is likely that such practices increase levels of antibiotic resistance, and the bi-directional exchange of resistance genes from farm to community should be worrying. If phage therapy becomes more commonplace in agricultural settings could we see the same effect? Managed carefully, cross-resistance between agricultural and clinical phage therapeutics shouldn’t be a problem, especially given the typically (but not exclusively) high host specificity of phages. But I do think it’s worth acknowledging the potential for interference in order to prevent repeating mistakes of the past. 4) Horizontal gene flow from phage application. Phages are so good at transferring genes among bacterial cells that we use them in the lab to do just that. It’s certain that this horizontal exchange goes on in the environment, so we must ask: if we pump out unnaturally high volumes of phages (especially those with broader host ranges) into the environment, how likely are these phages to move genes around. This is especially problematic when the genes being swapped encode antibiotic resistance, toxins, or virulence factors. In this case, our attempt at a cure could actually make things much worse. We know that phage-mediated gene-transfer has played a part in cholera epidemics  and we should be careful about facilitating the spread of other unwanted bacterial traits. 5) Impacts on natural communities. The importance of a ‘healthy’ microbiome is constantly espoused (so much so that Jonathan Eisen has produced an award for ‘Overselling the Microbiome;’ 11). Although the direct effects of a healthy microbiota are still predominantly correlational, minimizing the disruption to a community whilst removing a pathogenic species must surely be the ultimate goal. Phages could hold great potential in this regard as they tend to be fairly specific in their host range (so could act more like snipers) relative to antibiotics (which act more like indiscriminate hand-grenades). On the other hand, artificially high volumes of phages could have unexpected effects on microbial processes, particularly in an agricultural environment. To my knowledge the effects of adding high titres of phages to microbial communities in the environment remains unexplored. 6) Unpredictability of infection kinetics. This issue is an exciting one- the pioneer of phage therapy, Felix d’Herelle, is spuriously quoted as stating that immunity is contagious as well as the cure . He might have been wrong about the biology but the premise that the cure is transmissible certainly seems possible with replicating phages. The downside is that it makes it hard to predict the persistence of phages in the environment. Unlike an antibiotic with a known half-life, a phage therapy product could continue to persist and replicate in the environment indefinitely. Even at low densities this raises an ethical question of something being uncontainable. Recently, the ethical imperative of using phage therapy has been stated  and there is clearly a need for alternative strategies to antibiotic drugs. All of the concerns raised in our review are addressable and shouldn’t preclude the use of phage therapy in a clinical or agricultural setting. Moreover, all of the questions we have raised are readily answerable given the advances of microbial genomics over the last decade. We just need more data!! Suttle, C. A. 1994 The significance of viruses to mortality in aquatic microbial communities. Microb. Ecol. 28, 237–43. Kutateladze, M. and Adamia, R. 2008 Phage therapy experience at the Eliava Institute. Med Mal Infect 38, 426–430. D’Costa, V. M. et al. 2011 Antibiotic resistance is ancient. Nature 477: 457–461. Pirnay, J.-P. et al. 2011. The phage therapy paradigm: pret-a-porter or sur-mesure? Pharmaceutical Research 28:934–937. Waldor, M. K. and Mekalanos, J. J. 1996 Lysogenic conversion by a filamentous phage encoding cholera toxin. Science 272:1910–1914. Verbeken, G. et al. 2014 Taking bacteriophage therapy seriously: a moral argument. BioMed Research Int. 2014: Article ID 621316, 8 pages.